Protists are eukaryotes that first appeared approximately 2 billion years ago with the rise of atmospheric oxygen levels. On a geological time line, protists are among the first organisms that evolved after prokaryotes. Today’s eukaryotes evolved from a common ancestor with the following features: a nucleus that divided via mitosis, DNA associated with histones, a cytoskeleton and endomembrane system, the ability to make cilia/flagella. Protists vary widely in size, from single cells approximately 10 µm in size to multicellular seaweeds that are visible with the naked eye. Humans have been familiar with macroscopic organisms (organisms big enough to see with the unaided eye) since before there was a written history. It is likely that most cultures distinguished between animals and land plants, but most probably included the macroscopic fungi as plants. Therefore, it became an interesting challenge to deal with the world of microorganisms once microscopes were developed a few centuries ago. Many different naming schemes were used over the last couple of centuries, but it has become the most common practice to refer to eukaryotes that are not land plants, animals, or fungi as protists. Most protists are microscopic, unicellular organisms that are abundant in soil, freshwater, brackish, and marine environments. They are also common in the digestive tracts of animals and in the vascular tissues of plants. Others invade the cells of other protists, animals, and plants. Not all protists are microscopic. Some have huge, macroscopic cells, such as the plasmodia (giant amoebae) of myxomycete slime molds or the marine green alga Caulerpa, which can have single cells that can be several meters in size. Some protists are multicellular, such as the red, green, and brown seaweeds. It is among the protists that one finds the wealth of ways that organisms can grow. They are among the first organisms to evolve with the rise of eukaryotes. The oldest fossil evidence of eukaryotes, cells measuring 10 µm or greater, is about 2 billion years old. All fossils older than this appear to be prokaryotes. It is probable that today’s eukaryotes are descended from an ancestor that had a prokaryotic cellular organization. The last common ancestor (LCA) of today’s Eukarya had several characteristics that included: cells with nuclei that divided mitotically and contained linear chromosomes where the DNA was associated with histones; a cytoskeleton and endomembrane system; and the ability to make cilia/flagella during at least part of its life cycle. The LCA was aerobic because it had mitochondria that were the result of an aerobic alpha-proteobacterium that lived inside a host cell. Whether this host had a nucleus at the time of the initial symbiosis remains unknown. The LCA may have had a cell wall for at least part of its life cycle, but more data are needed to confirm this hypothesis. Today’s eukaryotes are very diverse in their shapes, organization, life cycles, and number of cells per individual. While today’s atmosphere is about one-fifth molecular oxygen (O2), geological evidence shows that it originally lacked O2. Without oxygen, aerobic respiration would not be expected; living things would have relied on fermentation instead. At some point before about 3.5 billion years ago, some prokaryotes evolved the ability to photosynthesize. Cyanobacteria used water as a hydrogen source and released O2 as a waste product. Originally, oxygen-rich environments were probably localized around places where cyanobacteria were active, but by about 2 billion years ago, geological evidence shows that oxygen was building up to higher concentrations in the atmosphere. Oxygen levels similar to today’s levels only arose within the last 700 million years. Recall that the first fossils that we believe to be eukaryotes date to about 2 billion years old, so they appeared as oxygen levels were increasing. Eukaryotes, having probably evolved from prokaryotes, have more complex traits in both cell and DNA organization. Prokaryotic genomic DNA is attached to the plasma membrane in the form of a nucleoid, in contrast to eukaryotic DNA, which is located in a nucleus. Eukaryotic DNA is linear, compacted into chromosomes by histones, and has telomeres at each end to protect from deterioration. Prokaryotes contain circular DNA in addition to smaller, transferable DNA plasmids. Eukaryotic cells contain mitochondrial DNA in addition to nuclear DNA. Eukaryotes separate replicated chromosomes by mitosis, using cytoskeletal proteins, whereas prokaryotes divide more simply via binary fission. Prokaryotic cells are known to be much less complex than eukaryotic cells since eukaryotic cells are considered to be present at a later point of evolution. It is probable that eukaryotic cells evolved from prokaryotic cells. Differences in complexity can be seen at the cellular level. The single characteristic that is both necessary and sufficient to define an organism as a eukaryote is a nucleus surrounded by a nuclear envelope with nuclear pores. All extant eukaryotes have cells with nuclei; most of a eukaryotic cell’s genetic material is contained within the nucleus. In contrast, prokaryotic DNA is not contained within a nucleus, but rather is attached to the plasma membrane and contained in the form of a nucleoid, an irregularly-shaped region that is not surrounded by a nuclear membrane. Cellular location of eukaryotic and prokaryotic DNA: Eukaryotic DNA is stored in a nucleus, whereas prokaryotic DNA is in the cytoplasm in the form of a nucleoid. Eukaryotic DNA is packed into bundles of chromosomes, each consisting of a linear DNA molecule coiled around basic (alkaline) proteins called histones, which wind the DNA into a more compact form. Prokaryotic DNA is found in circular, non-chromosomal form. In addition, prokaryotes have plasmids, which are smaller pieces of circular DNA that can replicate separately from prokaryotic genomic DNA. Because of the linear nature of eukaryotic DNA, repeating non-coding DNA sequences called telomeres are present on either end of the chromosomes as protection from deterioration. Mitosis, a process of nuclear division wherein replicated chromosomes are divided and separated using elements of the cytoskeleton, is universally present in eukaryotes. The cytoskeleton contains structural and motility components called actin microfilaments and microtubules. All extant eukaryotes have these cytoskeletal elements. Prokaryotes on the other hand undergo binary fission in a process where the DNA is replicated, then separates to two poles of the cell, and, finally, the cell fully divides. A major DNA difference between eukaryotes and prokaryotes is the presence of mitochondrial DNA (mtDNA) in eukaryotes. Because eukaryotes have mitochondria and prokaryotes do not, eukaryotic cells contain mitochondrial DNA in addition to DNA contained in the nucleus and ribosomes. The mtDNA is composed of significantly fewer base pairs than nuclear DNA and encodes only a few dozen genes, depending on the organism. Eukaryotes may have been a product of one cell engulfing another and evolving over time until the separate cells became a single organism. Endosymbiosis is the concept of one cell engulfing another and both cells benefiting from the relationship. Endosymbiosis was originally considered after the observation of the similarity between plant chloroplasts and free-living cyanobacteria. Peroxisomes may have been the first endosymbionts, caused by the increasing amount of atmospheric oxygen at that point in geological time. Over time, endosymbionts may have transferred some of their DNA to the host nucleus, thus becoming dependent on the host for survival and completing full integration into a single organism. To fully understand eukaryotic organisms, it is necessary to understand that all extant eukaryotes are descendants of a chimeric organism that was a composite of a host cell and the cell(s) of an alpha-proteobacterium that “took up residence” inside the host. This major theme in the origin of eukaryotes is known as endosymbiosis, where one cell engulfs another such that the engulfed cell survives and both cells benefit. Over many generations, a symbiotic relationship can result in two organisms that depend on each other so completely that neither could survive on its own. Endosymbiotic events probably contributed to the origin of the last common ancestor (LCA) of today’s eukaryotes. Endosymbiosis: Modern eukaryotic cells evolved from more primitive cells that engulfed bacteria with useful properties, such as energy production. Combined, the once-independent organisms flourished and evolved into a single organism. The endosymbiotic theory was first articulated by the Russian botanist Konstantin Mereschkowski in 1905. Mereschkowski was familiar with work by botanist Andreas Schimper, who had observed in 1883 that the division of chloroplasts in green plants closely resembled that of free-living cyanobacteria. Schimper had tentatively proposed that green plants arose from a symbiotic union of two organisms. Ivan Wallin extended the idea of an endosymbiotic origin to mitochondria in the 1920s. These theories were initially dismissed or ignored. More detailed electron microscopic comparisons between cyanobacteria and chloroplasts combined with the discovery that plastids ( organelles associated with photosynthesis) and mitochondria contain their own DNA led to a resurrection of the idea in the 1960s. The endosymbiotic theory was advanced and substantiated with microbiological evidence by Lynn Margulis in 1967. Chloroplasts in plants: A eukaryote with mitochondria engulfed a cyanobacterium in an event of serial primary endosymbiosis, creating a lineage of cells with both organelles. These cyanobacteria have become chloroplasts in modern plant cells. The cyanobacterial endosymbiont already had a double membrane. In 1981 she argued that eukaryotic cells originated as communities of interacting entities, including endosymbiotic spirochetes that developed into eukaryotic flagella and cilia. This last idea has not received much acceptance because flagella lack DNA and do not show ultrastructural similarities to bacteria or archaea. According to Margulis and Dorion Sagan, “Life did not take over the globe by combat, but by networking” (i.e., by cooperation). The possibility that the peroxisome organelles may have an endosymbiotic origin has also been considered, although they lack DNA. Christian de Duve proposed that they may have been the first endosymbionts, allowing cells to withstand growing amounts of free molecular oxygen in the earth’s atmosphere. However, it now appears that they may be formed de novo, contradicting the idea that they have a symbiotic origin. It is believed that over millennia these endosymbionts transferred some of their own DNA to the host cell’s nucleus during the evolutionary transition from a symbiotic community to an instituted eukaryotic cell (called “serial endosymbiosis”). This hypothesis is thought to be possible because it is known today from scientific observation that transfer of DNA occurs between bacteria species, even if they are not closely related. Bacteria can take up DNA from their surroundings and have a limited ability to incorporate it into their own genome. Mitochondria are energy-producing organelles that are thought to have once been a type of free-living alpha-proteobacterium. Eukaryotic cells contain varying amounts of mitochondria, depending on the cells’ energy needs. Mitochondria have many features that suggest they were formerly independent organisms, including their own DNA, cell-independent division, and physical characteristics similar to alpha-proteobacteria. Some mitochondrial genes transferred to the nuclear genome over time, yet mitochondria retained some genetic material for reasons not completely understood. The hypothesized transfer of genes from mitochondria to the host cell’s nucleus likely explains why mitochondria are not able to survive outside the host cell. One of the major features distinguishing prokaryotes from eukaryotes is the presence of mitochondria. Eukaryotic cells contain anywhere from one to several thousand mitochondria, depending on the cell’s level of energy consumption. Each mitochondrion measures between 1 to 10 µm in length and exists in the cell as an organelle that can be ovoid to worm-shaped to intricately branched. Mitochondria arise from the division of existing mitochondria. They may fuse together. They move around inside the cell by interactions with the cytoskeleton. However, mitochondria cannot survive outside the cell. As the amount of oxygen increased in the atmosphere billions of years ago and as successful aerobic prokaryotes evolved, evidence suggests that an ancestral cell with some membrane compartmentalization engulfed a free-living aerobic prokaryote, specifically an alpha-proteobacterium, thereby giving the host cell the ability to use oxygen to release energy stored in nutrients. Alpha-proteobacteria are a large group of bacteria that includes species symbiotic with plants, disease organisms that can infect humans via ticks, and many free-living species that use light for energy. Several lines of evidence support the derivation of mitochondria from this endosymbiotic event. Most mitochondria are shaped like alpha-proteobacteria and are surrounded by two membranes, which would result when one membrane-bound organism engulfs another into a vacuole. The mitochondrial inner membrane involves substantial infoldings called cristae that resemble the textured, outer surface of alpha-proteobacteria. The matrix and inner membrane are rich with enzymes necessary for aerobic respiration. Micrograph of mammaliam mitochondria: In this transmission electron micrograph of mitochondria in a mammalian lung cell, the cristae, infoldings of the mitochondrial inner membrane, can be seen in cross-section. 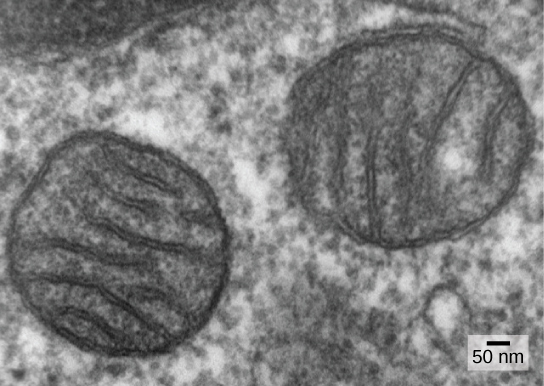 Mitochondria divide independently by a process that resembles binary fission in prokaryotes. Specifically, mitochondria are not formed de novo by the eukaryotic cell; they reproduce within the cell and are distributed between two cells when cells divide. Therefore, although these organelles are highly integrated into the eukaryotic cell, they still reproduce as if they are independent organisms within the cell. However, their reproduction is synchronized with the activity and division of the cell. Mitochondria have their own circular DNA chromosome that is stabilized by attachments to the inner membrane and carries genes similar to genes expressed by alpha-proteobacteria. Mitochondria also have special ribosomes and transfer RNAs that resemble these components in prokaryotes. These features all support that mitochondria were once free-living prokaryotes. Mitochondria that carry out aerobic respiration have their own genomes, with genes similar to those in alpha-proteobacteria. However, many of the genes for respiratory proteins are located in the nucleus. When these genes are compared to those of other organisms, they appear to be of alpha-proteobacterial origin. Additionally, in some eukaryotic groups, such genes are found in the mitochondria, whereas in other groups, they are found in the nucleus. This has been interpreted as evidence that genes have been transferred from the endosymbiont chromosome to the host genome. This loss of genes by the endosymbiont is probably one explanation why mitochondria cannot live without a host. Despite the transfer of genes between mitochondria and the nucleus, mitochondria retain much of their own independent genetic material. One possible explanation for mitochondria retaining control over some genes is that it may be difficult to transport hydrophobic proteins across the mitochondrial membrane as well as ensure that they are shipped to the correct location, which suggests that these proteins must be produced within the mitochondria. Another possible explanation is that there are differences in codon usage between the nucleus and mitochondria, making it difficult to be able to fully transfer the genes. A third possible explanation is that mitochondria need to produce their own genetic material so as to ensure metabolic control in eukaryotic cells, which indicates that mtDNA directly influences the respiratory chain and the reduction/oxidation processes of the mitochondria. Plastids may derive from cyanobacteria engulfed via endosymbiosis by early eukaryotes, giving cells the ability to conduct photosynthesis. Chloroplasts, chromoplasts, and leucoplasts are each a type of plastid. Plastids in eukaryotes derive from primary endosymbiosis with ancient cyanobacteria. Chlorarachniophytes are a type of algae that resulted from secondary endosymbiosis, when a eukaryote engulfed a green alga (which itself was a product of primary endosymbiosis with a cyanobacterium). Plastids share several features with mitochondria, including having their own DNA and the ability to replicate by binary fission. Some groups of eukaryotes are photosynthetic: their cells contain, in addition to the standard eukaryotic organelles, another kind of organelle called a plastid. There are three type of plastids: chloroplasts, chromoplasts, and leucoplasts. Chloroplasts are plastids that conduct photosynthesis. Chromoplasts are plastids that synthesize and store pigments. Leucoplasts are plastids located in the non-synthetic tissues of a plant (e.g., roots) and generally store non-pigment molecules. Like mitochondria, plastids appear to have a primary endosymbiotic origin, but differ in that they derive from cyanobacteria rather than alpha-proteobacteria. Cyanobacteria are a group of photosynthetic bacteria with all the conventional structures of prokaryotes. Unlike most prokaryotes, however, they have extensive, internal membrane-bound compartments called thylakoids, which contain chlorophyll and are the site of the light-dependent reactions of photosynthesis. In addition to thylakoids, chloroplasts found in eukaryotes have a circular DNA chromosome and ribosomes similar to those of cyanobacteria. Each chloroplast is surrounded by two membranes, suggestive of primary endosymbiosis. The outer membrane surrounding the plastid is thought have derived from the vacuole in the host, while the inner membrane is thought to have derived from the plasma membrane of the endosymbiont. Chloroplast: (a) This chloroplast cross-section illustrates its elaborate inner membrane organization. Stacks of thylakoid membranes compartmentalize photosynthetic enzymes and provide scaffolding for chloroplast DNA. (b) The chloroplasts can be seen as small green spheres. There is also, as with the case of mitochondria, strong evidence that many of the genes of the endosymbiont transferred to the nucleus. Plastids, like mitochondria, cannot live independently outside the host. In addition, like mitochondria, plastids derive from the binary fission of other plastids. Researchers have suggested that the endosymbiotic event that led to Archaeplastida (land plants, red and green algae) occurred 1 to 1.5 billion years ago, at least 500 million years after the fossil record suggests the presence of eukaryotes. Endosymbiosis involves one cell engulfing another to produce, over time, a co-evolved relationship in which neither cell could survive alone. The chloroplasts of red and green algae, for instance, are derived from the engulfment of a photosynthetic cyanobacterium by an early prokaryote. This leads to the question of the possibility of a cell containing an endosymbiont to become engulfed itself, resulting in a secondary endosymbiosis. Not all plastids in eukaryotes derive directly from primary endosymbiosis. Some of the major groups of algae became photosynthetic by secondary endosymbiosis; that is, by taking in either green algae or red algae as endosymbionts. Numerous microscopic and genetic studies support this conclusion; secondary plastids are surrounded by three or more membranes; some secondary plastids even have clear remnants of the nucleus of endosymbiotic algae. Primary and secondary endosymbiosis: The hypothesized process of endosymbiotic events leading to the evolution of chlorarachniophytes is shown. In a primary endosymbiotic event, a heterotrophic eukaryote consumed a cyanobacterium. In a secondary endosymbiotic event, the cell resulting from primary endosymbiosis was consumed by a second cell. The resulting organelle became a plastid in modern chlorarachniophytes. Red and green algae: (a) Red algae and (b) green algae (visualized by light microscopy) share similar DNA sequences with photosynthetic cyanobacteria. Scientists speculate that, in a process called endosymbiosis, an ancestral prokaryote engulfed a photosynthetic cyanobacterium that evolved into modern-day chloroplasts. Molecular and morphological evidence suggest that the chlorarachniophyte protists are derived from a secondary endosymbiotic event. Chlorarachniophytes are rare algae indigenous to tropical seas and sand. These protists are thought to have originated when a eukaryote engulfed a green alga, the latter of which had already established an endosymbiotic relationship with a photosynthetic cyanobacterium. Several lines of evidence support that chlorarachniophytes evolved from secondary endosymbiosis. The chloroplasts contained within the green algal endosymbionts are capable of photosynthesis, making chlorarachniophytes photosynthetic. The green algal endosymbiont also exhibits a stunted vestigial nucleus. In fact, it appears that chlorarachniophytes are the products of a recent (on the scale of evolution ) secondary endosymbiotic event. The plastids of chlorarachniophytes are surrounded by four membranes: the first two correspond to the inner and outer membranes of the photosynthetic cyanobacterium, the third corresponds to the green alga, and the fourth corresponds to the vacuole that surrounded the green alga when it was engulfed by the chlorarachniophyte ancestor. The process of secondary endosymbiosis is not unique to chlorarachniophytes. In fact, secondary endosymbiosis of green algae also led to euglenid protists, whereas secondary endosymbiosis of red algae led to the evolution of dinoflagellates, apicomplexans, and stramenopiles.